Posted August 24, 2017 & filed under Hydrology. The US EPA’s 303(d) Program of the Clean Water Act assists states, territories and authorized tribes in submitting lists of impaired waters and developing the Total Maximum Daily Load (TMDL) for a stream or river. TMDL is a regulatory term describing a plan for restoring impaired waters that identifies the maximum amount of a pollutant – the load – that a body of water can receive on a daily basis while still meeting water-quality standards. A TMDL is composed of load allocations for both point sources and nonpoint sources. 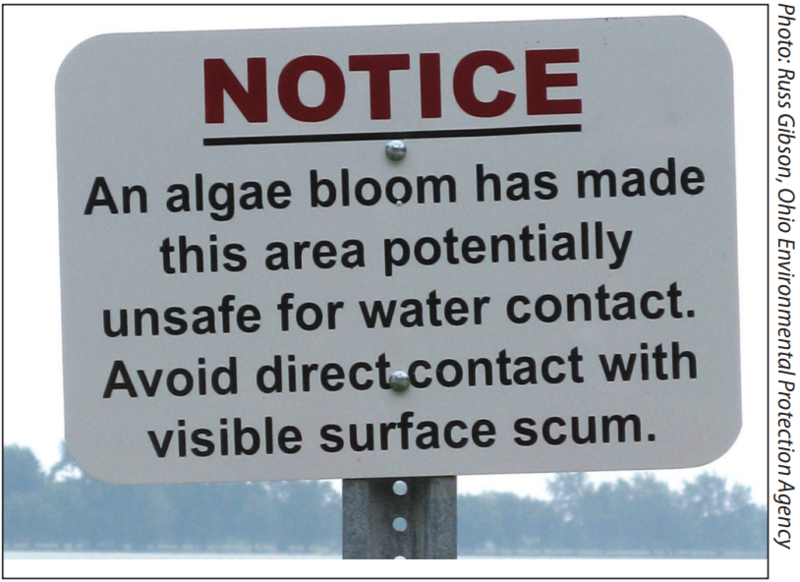 While nitrogen and phosphorus are essential for a healthy aquatic ecosystem, an excess of these nutrients in a waterbody results in overgrowth of aquatic plants, increased harmful algal blooms, decreased light penetration and decreased levels of dissolved oxygen. Any of these conditions reduces the recreational use of the water for people and makes it difficult for fish and other aquatic animals to live. The US EPA National Rivers and Streams Assessment (2008/2009) evaluated 1.2 million miles of rivers and streams in the US and found that more than 40% of river and stream miles have levels of nutrients that are too high. As reported by the US EPA, “The primary sources of nitrogen and phosphorous pollution are runoff of fertilizers, animal manure, sewage treatment plant discharges, stormwater runoff, car and power plant emissions, and failing septic tanks. In the Mississippi River Basin, which spans 31 states and ultimately drains into the Gulf of Mexico, nutrients from row crops and concentrated animal feeding operations contribute the most nutrient pollution.”. A source of nutrients that is often overlooked is groundwater baseflow to streams and rivers. Broadly, baseflow is the flow of a stream or river that exists even when there is no direct runoff of precipitation over the land. In other words, baseflow is the flow of the stream when it has not rained for many days and so there is no precipitation-related runoff. Man-made point discharges of treated wastewater or permitted releases can contribute to baseflow. However, groundwater discharge is usually the primary contributor of sustained baseflow in a stream or river. If the nutrient load from groundwater baseflow is not well quantified or is ignored, it will be very difficult or impossible for local managers to meet the nutrient management objectives established by a TMDL. What is known about the nutrient load of groundwater? A comprehensive national analysis of nutrients in streams and groundwater was conducted by the US Geological Survey (USGS) using data collected from 1992 through 2004. 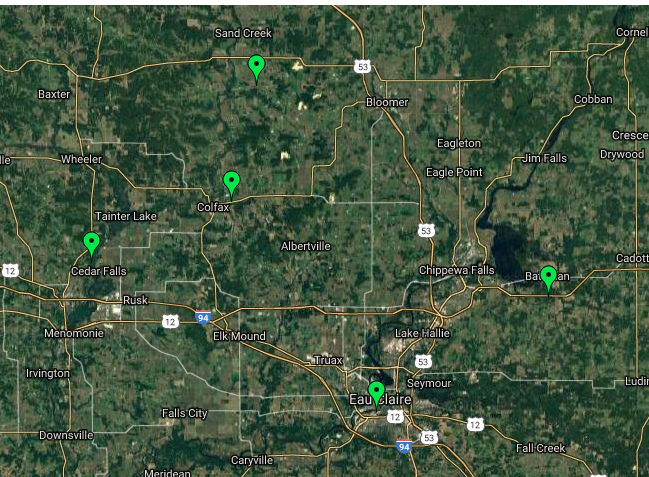 The analysis was published in 2010 by the National Water-Quality Assessment Program as USGS Circular 1350. A major finding of the analysis was that nitrate concentrations greater than the Maximum Contaminant Level (MCL) are more prevalent and widespread in groundwater than in streams. In fact, of studies in shallow groundwater in agricultural areas, 83% percent had one or more samples (of 20 to 30 wells sampled) with a nitrate concentration greater than the MCL. Only 28% of sreams in the agricultural areas had one or more exceedence. 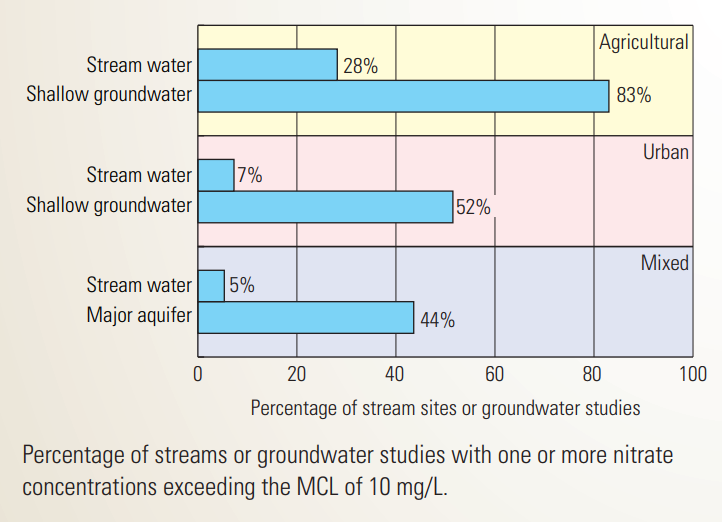 In urban settings, 52% of studies documented one or more samples with a nitrate concentration MCL exceedance, compared to only 7% of streams. From: Dubrovsky, N.M., and Hamilton, P.A., 2010, Nutrients in the Nation’s streams and groundwater: National Findings and Implications: U.S. Geological Survey Fact Sheet 2010-3078, 6 p. Accessed August 3, 2017 at https://pubs.usgs.gov/fs/2010/3078/. The analysis goes on to state that “Groundwater contributions of nutrients to streams can be significant — particularly for nitrate.”. As part of the study, 148 small streams across the Nation were assessed and it was found that for two-thirds of these streams, at least one-third of the total annual load of nitrate load was derived from baseflow. In certain hydrogeologic settings, groundwater can also contribute a significant phosphorus load to streams. The USGS analysis in Circular 1350 documents at the national level what has also been observed in numerous local and smaller-scale studies. One example is demonstrated by the following figure from an urban study conducted by the Institute on the Environment at the University of Minnesota. 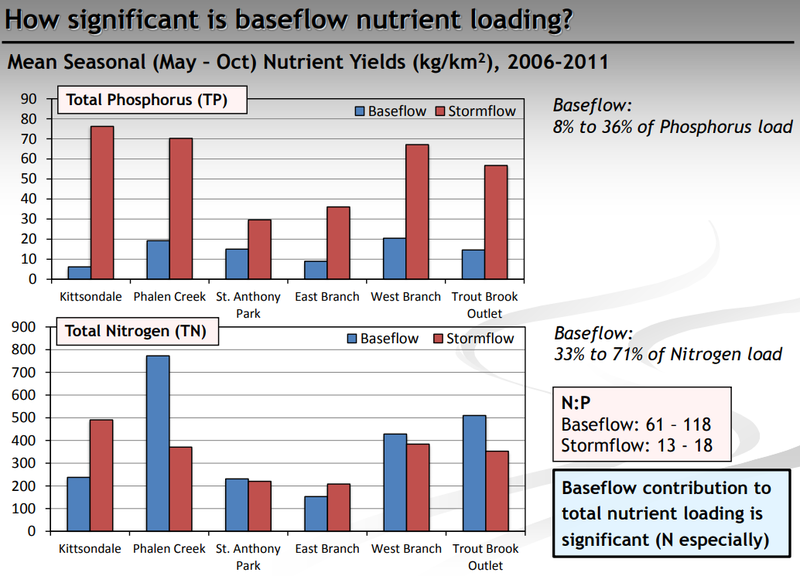 The graph shows that the contribution of groundwater baseflow to the total nutrient load of surface water is significant for both phosphorus and nitrogen, but particularly nitrogen. This urban area was almost completely sewered for stormwater and the year-round, dry-weather flow in the stormwater system was monitored for flow, nutrients, and other chemistry. To fully account for the contribution of groundwater to an established TMDL, the flow and dynamics of the groundwater system must be well known. 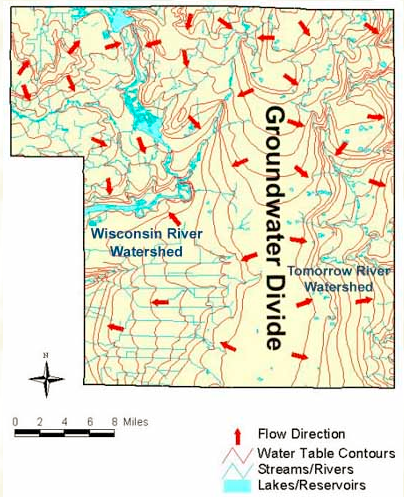 In Relevance of Water-Level Data to Ground-Water Quality Issues, USGS Circular 1217 published in 2001, it is stated that predictions of the speed and direction of movement of ground-water contaminants – including nutrients – are “based on determination of the gradient (slope) of the water table or potentiometric surface in the affected aquifer”. Periodic measurements of groundwater level are often insufficient for defining a potentiometric surface that is dynamic and changing in response to seasonal hydrologic events or pumping stresses. As also stated in Circular 1217 ”longer term water-level measurements are often needed to develop an understanding of how ground-water contaminants migrate from their sources through the ground-water system.”. This is particularly true if groundwater flow models are used in predicting nutrient transport in groundwater. Water-level data of “sufficient duration and frequency of measurement are needed to calibrate and evaluate the reliability of the flow component of these models before realistic simulations of contaminant transport can be made.”. Local, state, and federal mandates for assessing and monitoring local water resource continue to expand. The successful management of water quality in watersheds requires understanding the dynamic contributions of both groundwater and surface water. TMDLs will be successful only if the groundwater baseflow contribution of nutrients is understood and accounted for. Wellntel sensor systems have been designed explicitly to provide the temporal density of data necessary to observe dynamic groundwater systems responding to a range of stresses. And networks of Wellntel systems provide the spatial density necessary to define potentiometric surfaces, quantify hydraulic gradients, and support the assessment of contribution of groundwater baseflow loads to a TMDL. 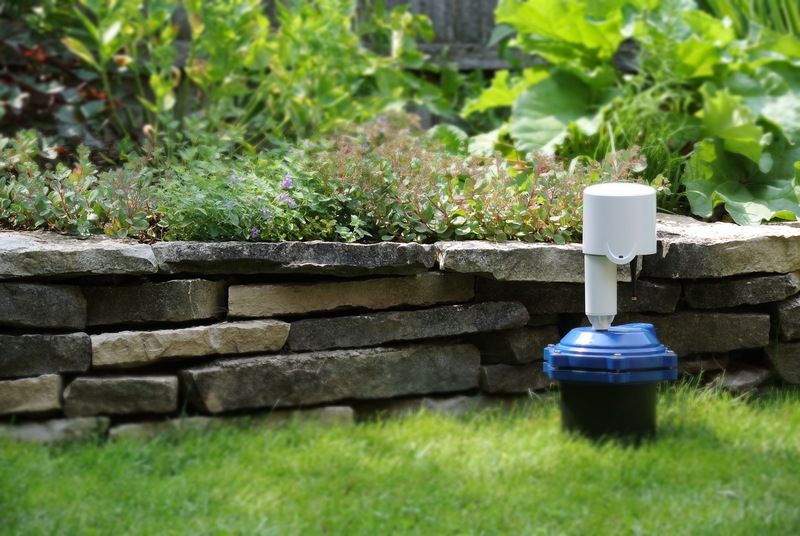 Wellntel provides the means to quantify the groundwater nutrient contribution with greater accuracy at a much lower cost that has been possible before. In quantifying more accurately the groundwater contribution to nutrient loading, a more precise TMDL can be developed which will then have a greater likelihood of success.